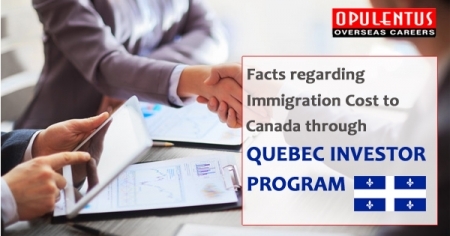 Currently the immigration authority in Quebec has increased the threshold for the application window to$1.2 million. In the past it was $800,000. Moreover, this is a passive investment for five years carrying no interest. It is returnable after five years and is also guaranteed by the government. The government in Quebec keeps the interest accrued. The program allows applicants to finance the investment by using designated financial intermediaries. The financing schemes need a payment of $350,000 prior to the intermediary loans and $850,000 for meeting the investment of $1.2 million. The financial intermediary, who has the approval of the government, deposits the total amount in Investment in Quebec. The interest from the down payment covers the bank fees and commission of the Immigration Agent. The down payment of $350,000 is the walk away amount representing the cost of interest of lost opportunity that an applicant earns after investing $1,200,000 in the open market for the period. Candidates must also have personal net worth of $2 million which must be acquired legally. Previously it was $1.6 million for the year 2018-19. The Quebec Investor program is popular and is a large program in the business and investment sphere. It is only option in the country where wealthy business immigrants get permanent residence in Canada after making a passive investment. The present 2018-19 application period commences on September 10th, 2018 and is valid till March 15, 2019. Moreover, it will receive 1,235 applications from China, Hong Kong, Macau and 665 from other places. Applicants who possess advance intermediate abilities in the French language do not have to worry regarding quota limitations. Furthermore, after the termination of the federal government version in 2014, this program is prominent in the business immigration landscape. Quebec accounts for $1 billion direct investments to the province since its inception. Intention to settle in Quebec province. Gathering relevant documentation to support personal net worth and managerial experience. Proof of legal, historical accumulation of assets. A complete application is reviewed by an approved financial intermediary licensed by the government with quota allocations from immigration authorities. Submission of application to immigration authorities. Issuing A file number by the province within 30-days of reception. A notice regarding the status of interview or its waiver within 12 months of submission. A decision in 30 days after conducting interview. Making the investment within 110 days of decision by Approved applicants. Receiving a Quebec Selection Certificate. This allows you to apply for federal permanent residence. Submission of application to federal authorities, who conduct security and medical checks. Finalization of applications to issue visa within 12 to 44 months depending upon nations. Following the approval, a request for passports and a confirmation of PR is issued to the applicant/dependents. These persons have to travel to Canada prior to the expiry of the C.O.P.R. document.